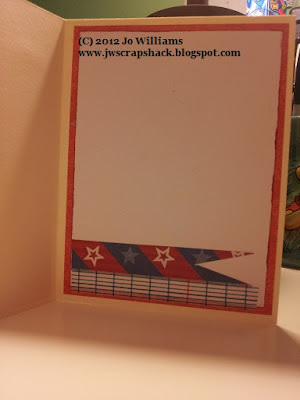 ~Jo's Scrap Shack~: Happy 4th~ July with Just A Scrappin! Happy 4th~ July with Just A Scrappin! Happy Fourth of July my friends!!!! I am sure many of you have had a taste of summer with this heat we have all been getting and with the Holiday comes pool parties, bbqs and family fun! Fourth of July for my family is a huge event and it's the start of our summer and it's the start of a month full of amazing challenges and a super blog hop over at Just A Scrappin'! This week's challenge is to create a project, card or layout using the colors Red, White and Blue and to use any other two colors. So here is my card for this week's challenge. My card is a standard A2 card. I used the three main colors of red/white/blue and the two colors that I incorporated were cream and black. The cardstock used was bazzill and the pattered papers are from K and Company. I cut the two banners with my trimmer and created the banners with my scissors. The word "happy" is a stamp by "Ditto" and the "4th" was a stamp I used from Making Memories numbers stamps. The "4th" sentiment is up on foam tape. I also added some washi tape under the sentiment with a quarter of an inch strip of red paper to draw my reader's eyes into the center of the card. 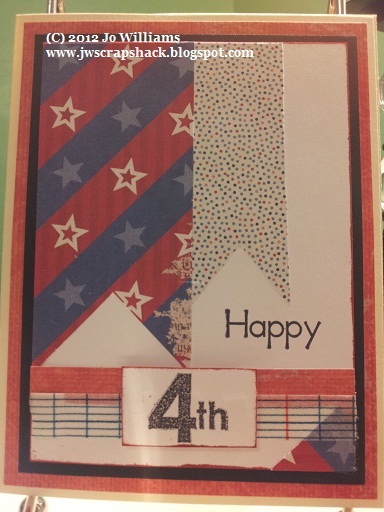 I usually do not make July 4th cards so I think this came out pretty nice. Very patriotic, don't ya think? Now be sure to head on over to Just A Scrappin and see what my design team sisters have created and link up your own project for a chance to win some blog candy!! Enjoy your Holiday!!! What a great card! This is just too cool! this is so fun and festive. wonderful card, Jo! Great card Jo. Love the overall look and feel of your card and how you carried it to the inside. Great card! Love the papers and the flags! Have a great weekend, Jo! What a great card Jo! Love that the inside is just as exciting as the front! I love your use of the banners on your project, I especially love the one inside! !